Tomato Onion Chutney, this is one of the simple and easy chutney to make for idli or dosa. 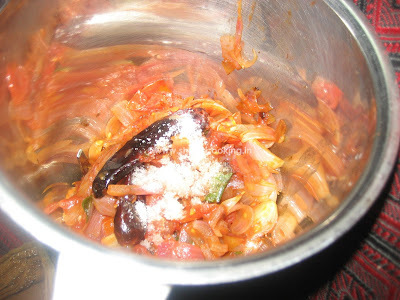 There are numerous ways in which we can prepare this chutney. For example, sometimes you can add urad dal while making this chutney or you can make variation using tamarind. Varying the onion and tomato quantity also will make difference in taste. You can try different methods each time you make this chutney. 1. Keep all the ingredients ready. Roughly chop the onion and tomatoes. 2. Heat oil in a pan, add onion and garlic. Saute till the onion turns transparent. 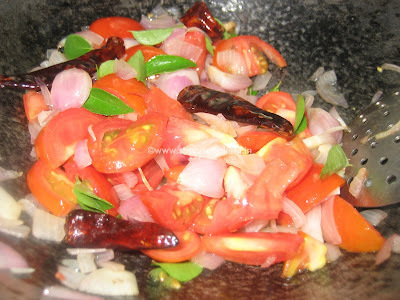 Add tomatoes, dry red chilies and curry leaves. Saute till the tomatoes are soft and mush. Switch off the flame. 3. Allow it to cool. 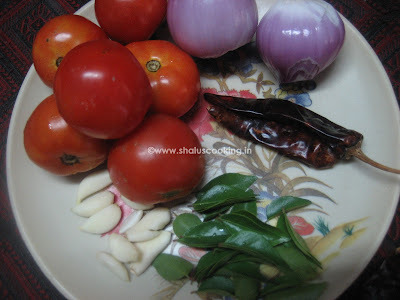 Add the onion tomato mixture to a blender and grind it to make chutney. 4. Transfer the chutney to a bowl. If you wish, you can temper it with mustard, urad dal and curry leaves. Here I have showed the plain chutney.